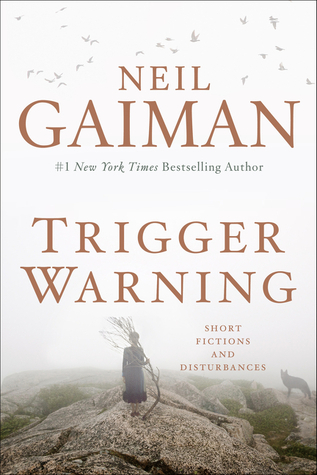 This is a collection of Gaiman’s recent short stories, which he calls “short fictions and disturbances”. This epithet matches well with the content of some of these stories. Trigger Warning contains over 20 short pieces of writing, ranging from poems to short fairy tales. There are simply too many pieces to write a synopsis of each one. In addition, the stories are not related in any way (character wise or even genre wise). Each of these stories is it’s own world, a unique way of putting together a collection of fictions. Before this, I had never read a book of short stories that didn’t have anything in common. That being said, most of the stories were a bit disturbing. I would even categorize a few of them as “horror”; but most of them fall into the category of “fantasy” or “science fiction”. For Doctor Who fans– Gaiman even includes a short story about the Doctor with a bow tie and Amy Pond. Neil Gaiman certainly has a way of imagining other worlds and dimensions filled with made-up creatures and complex characters. Admittedly, I did get bored with a few of his stories, but most of them kept my attention and were easy to follow. I’m very proud to be the owner of a signed first edition of this book. I went to my local bookstore on it’s release date last month and was one of the first to get a copy! Love this. Thanks for sharing! If you’re ever in need of more book reviews or musings, please follow! Thanks!! !